These cute striped critters are fun to watch. There is a great debate whether you should provide seed on the feeder for the summer and early fall period of the year to attract birds. Those who enjoy the casual summer visit by chipping sparrows or a more exotic clay-coloured sparrow or Indigo bunting may argue that it’s worth the effort. However, visits by larger critters often deter people from maintaining a feeder in summer. It is possible, however, to put out a small amount of seed in the early morning that will be consumed before the evening and reduces the risk of larger night visitors. There is another creature though that is less feared and can quickly remove anything you have to offer during the daylight hours. Small and rambunctious, this creature will peg your selected feeder sites and quickly gather the offerings in a couple of pouch-like compartments that act as sacks to transport all that precious cargo. It is like nature’s vacuum cleaner. The gatherings are moved to a safer area for consumption or storage in a hidden chamber or crevice within the yard. These creatures do not stop. The eastern chipmunk will remove everything, so it becomes debatable whether you are truly feeding birds or these intruders. At camps, provincial and municipal parks and, in areas where cats are not as common, our little “friends” can become quite tame and actually walk on your pant leg or take food directly from your hand when trained. Peanuts are preferred as well as sunflower seeds in or out of the shell. If you offer the nut in the shell, you save by using less food to keep them busy. Patience is required. Rest yourself in a comfortable position, offer the peanut, but do not move. The animal has to learn that you are a safe bet. Once they get into the habit, they may be difficult to ignore. A small word of warning is necessary. These creatures can find a way into the porch where the food is stored, so use caution. Chipmunks are also known as tamias. They are not as prolific as mice but may have two litters of three to five young in a year. They can live several years but predation from a number of carnivores makes life a tenuous one. Those with a little more acute observation will note that our northern area also has a smaller chipmunk called the least or western chipmunk. This smaller and more brightly-coloured cousin can be found along roadside rubble and rocky areas where it can den and escape danger. 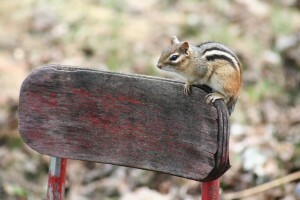 Unlike red squirrels, chipmunk are not usually seen in winter. They go through a state of shallow daily torpor, which is a way of reducing their energy requirements to survive. This process also allows them to wake up during certain climatic opportunities. Chris Blomme is a Laurentian University biologist and member of the Sudbury Ornithological Society.